Emergency Clogs, Toilet and Tub Backups? Call Plumbing Experts NW 24/7! Sewer Repair Marysville Folks Leave Rave Reviews For! Affordable expert care from a Marysville Plumber with incredible staff and experienced technicians. Call us 24/7! We locate water leaks and we do water leak repair quickly and efficiently. Don't wait! Your water bill won't. Sewer Repairs can't happen until you know precisely what is going on with your sewer. Get a sewer scope for peace of mind. Water Heaters are great until they malfunction. Get us on the case, and get repair or replacement handled properly. Plumbing Experts NW is your Drain Cleaning authority to end the clogs and stoppages once and for all. Expert sewer repair in Marysville WA. You won't find this level of Sewer Cleaning, Repair, or Replacement at every company. Sewer line clogs or stoppages can turn from an inconvenience to a serious problem very quickly. Wastewater and sewage "backing up" into your toilets, tubs, or basement drains should be handled quickly as it can be a major threat to your property and your health. If you suspect a backup or a need for sewer cleaning or sewer repair in Marysville areas, please don't hesitate to call us over here at Plumbing Experts NW. We show up and do the work to figure out what's causing your clogs, and then we give you options and up-front pricing to get your situation under control. Sewage appearing in your yard is another main symptom. Plumbing Experts NW gives you solutions and options for clearing any clog or possible repair of your sewer line. We use sewer cleaning tools for snaking, and also grinding roots like any known rooter company might do. Our techs come ready with sewer camera video technology as well, so we can clear your sewer drain line and then find out if there is any complication, such as a crack, break, or collapse of the sewer line itself. After clearing this line and utilizing our sewer video camera, we could find that there is one of these cracks or breaks in the line requiring our sewer repair services. Sewer breaks are quite a bit more common in older houses, so these homes may need sewer repair in Marysville WA. Sewer materials that were used in the past may break down at any time and will be more susceptible to root intrusion. 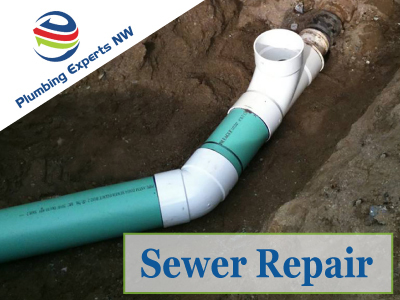 Plumbing Experts NW has sewer technicians that present you with solutions for how to handle your sewer line. When you are ready and need it, we are the sewer repair Marysville residents (and commercial buildings for that matter) count on. At Plumbing Experts NW, your satisfaction is 100% guaranteed. You will be able to count on a job well done, whether it's a sewer cleaning or a sewer repair/replacement situation.